This 1994 U.S. commemorative silver dollar proof commemorates the creation of the National Prisoner of War Museum in Andersonville, Georgia. It’s located at Camp Sumter, one of the largest Confederate military prisons established during the Civil War. Its obverse comes courtesy of Thomas Nielsen, a decorated Vietnam veteran and Department of Veterans Affairs employee. It shows an American eagle taking flight through a ring of barbed wire, a broken chain around its ankle. More than 800,000 Americans have suffered as P.O.W.s. This silver dollar proof helps us show that they are never forgotten. ONE-YEAR-ONLY DESIGN – The National Prisoner of War Museum in Andersonville, Georgia is seen on one side of this reverential coin while an eagle in flight is featured on the obverse. The image of the eagle is particularly poignant as it was designed by Thomas Nielsen, a decorated Vietnam War veteran. Nielsen’s design shows the eagle with a broken chain around its leg, symbolic of its flight towards freedom. 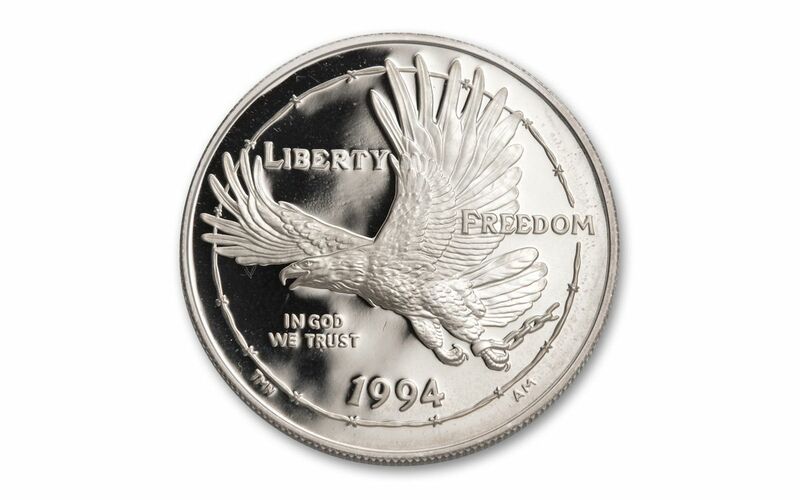 STRUCK IN FINE SILVER – Each 1994-P $1 Prisoners of War Silver Dollar Proof was struck in 90% silver. 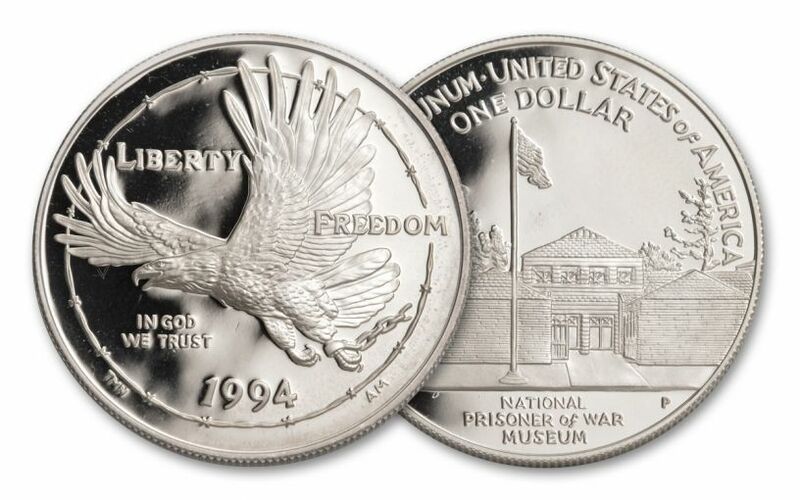 LEGAL-TENDER COINAGE – These Prisoners of War Dollar Silver Proofs are $1 United States legal tender. GORGEOUS PROOF CONDITION – Your 1994-P $1 Prisoners of War Silver Dollar is in gorgeous Proof condition, meaning it was expertly crafted by the mint from hand-selected planchets, polished dies and multiple strikes to produce beautifully frosted details rising over mirror-like fields! 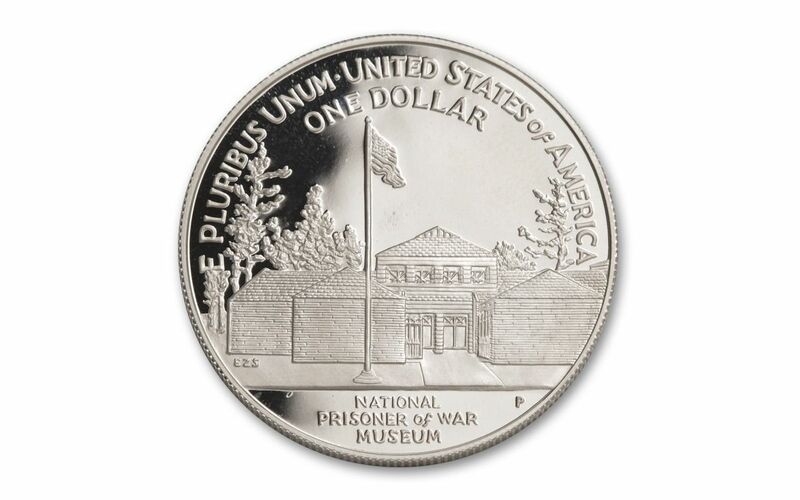 LOW LIMITED EDITION LIMIT – The edition limit for the 1994-P $1 Prisoners of War Silver Dollar Proof is 224,449. Dedicated to all of America’s POWs, the 1994-P $1 Prisoners of War Museum Silver Proof is a popular one-year-only issue. Get one now!